Quicklens offers a wide range of products and services at incredibly low prices in Australia. These Quicklens promo codes expire soon, so don’t forget to bookmark this page now. Exclusive Quicklens voucher codes: Shop for one of the most popular lenses on the market, 1 Day Acuvue Moist by Johnson & Johnson and save AU$3. Quicklens free delivery offer: Order contact lens, disposable lens and much more above $98 to receive free shipping. New Quicklens discount: Enjoy crystal clear vision with Vodaclear daily lens from Quicklens available for AU$18.80. Latest Quicklens promo code: Purchase disposable Air Aqua Optix disposable lens by Ciba Vision from Quicklens for AU$27.90. Seasonal Quicklens deal & sale: Purchase FreshLook ColorBlends lenses that offers a wide palette of beautiful colors for just AU$16. Limited time Quicklens coupon: Shop for this latest Softlens 38 contact lenses by Bausch & Lomb combinig high performance and clear vision for just AU$15.50. Ordering the correct, quality standard contact lenses can be a tedious and sometimes expensive process. Quicklens is in contact lens business that has delivered over 150 million contact lenses. They are based in Singapore, but operate in Australia and New Zealand. 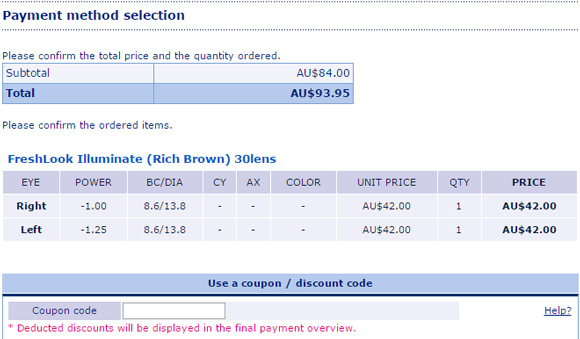 Due to restrictions on medical supplies, the contact lenses cannot be shipped outside Australia. If you switch to the New Zealand website address, you can order contact lenses for a New Zealand address if you have an optometrist prescription. Quicklens also operates out of New Zealand—providing the same services. Being registered with Quicklens makes shopping streamlined and easy to use. The system will save your contact and financial details, making checking out, and tracking your favourite products easy. 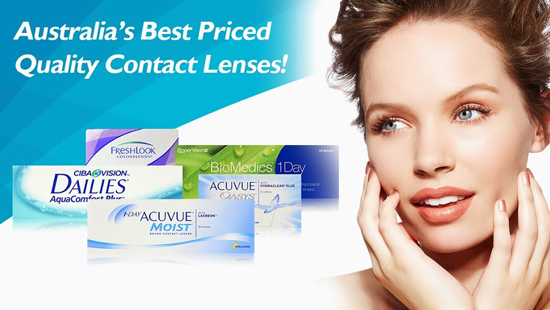 Quicklens is Australia’s largest contact lens retailer. They offer a variety of lenses—including some of the world’s best known brands. The Lenses offered include all different types, colours and styles. Daily Lenses — For changing daily, includes Acuvue, Focus, Freshlook, and SofLens brands. Fortnightly Lenses — Includes Acuvue, Biomedics, and Optix brands. Monthly Lenses — Purevision, Maxi Eyes, Proclear. Colour Lenses — For people that want a bit of customization. Toric lenses — Shaped differently to normal lenses for people with astigmatism. Package deals — Save money by buying in bulk. Quicklens most popular stocked brands are displayed on the top banner of the website, so customers can choose to browse the stock exclusively from their favourite brands. These include, Acuvue, Focus, Freshlook, Soflens, Biomedics, and Maxi Eyes. Users can browse via their preferred form of contact lens based on the duration of wear they are made for. The package deals are great for customers that want to buy in bulk, stock up and pay less for shipping over time. Buying from the package categories is also the best way to make savings with vouchers. Users are also given the option to shop via brand, the most popular of which is located on the top bar navigation. Make sure to scroll down and check out the News section on the Quicklens homepage. Listed here are regular updates on stock markdowns, upcoming and new products, and ongoing promotions. A look at this section might end up helping you save money on the products you want! The coloured contact lens range offered by Quicklens offers a large diversity of colours for people that like to change things up from day to day, and experiment with different styles. If you like the thought of changing the colour of your eyes to shake up your everyday look, or dress-up for a special occasion, then these might be for you. Say goodbye to bad eyesight and shop for some brand new lenses using latest discount codes available under vision category on our site. The recommended section of the Quicklens website is an awesome way to quickly see some of the best deals across all the categories of contact lens, as well as get an idea on the best bargains, brands and types available. Check back here regularly to see updates. A great way to make savings and get the lowest prices contact lenses in Australia is to use the online discounts provided. Quicklens runs series of discount coupon codes on their Facebook page, Twitter, and through email subscription. The codes do expire however—so make sure you use them fast. You can only use one discount per order, and per customer. When you get to checkout, there will be an option to enter your discount code into an input box; the new amount with the discount will be displayed in the final payment overview before purchase. Looking to buy brand new glass at bargaining price? Check out Vision Direct , EyeBuyDirect and Glasses Online providing wide range of prescription eyewear, contact lenses and optical products at lowest possible price. Quicklens delivers anywhere in Australia for a single flat fee of $9.95 (per order). You cannot cancel orders once they have been placed, so choose carefully. You can get a refund if you receive damaged products, or if the product you received is not what you ordered, but you cannot get one if you ordered the wrong ones by mistake. You can use the contact form listed below to get in touch in regards to a refund. If for any reason you need to get in contact with someone from Quicklens, the best place to start is by visiting the FAQ section of their website. Whether you have questions about a product, or about any issue, you may find answers here. Alternatively, you can contact someone directly via the contact details listed below, or via one of Quicklens social media channels.